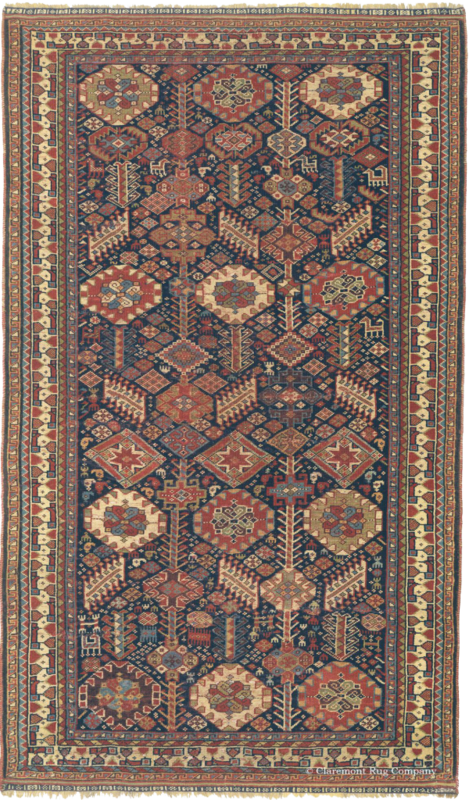 Produced in the rugged, mountainous areas of the Caucasus, Persia and Central Asia, tribal carpets have been woven for millennia, and form one of the earliest and most enduring modes of human expression. Antique tribal rugs are greatly prized by modern audiences for their elemental simplicity, exceptional inventiveness, and a timeless mastery of balance and harmony that appears equally fresh and immediate in contemporary settings. Tribal rugs vary enormously. The majority of styles feature bold, geometric patterning as a major component, often drawn with great spontaneity that reveals the hand of the individual weaver, as well as a tendency toward joyful creativity that is a central part of the worldview of many tribal groups. Inspired by their immersion in nature and a continual exposure to dramatic mountainous environments, weavers in the tribal tradition had a familiarity with striking graphic or abstracted pastoral forms and intense, varied color that is carried into and informs their work. The community aspect of tribal life is well-represented in their carpets. Living in small bands with strong kinship and family connections, sharing a common dialect and spiritual values, tribal groups developed an intense cohesion and pride, a natural and comfortable alignment of worldview and values cheerfully reinforced by their communal way of life. 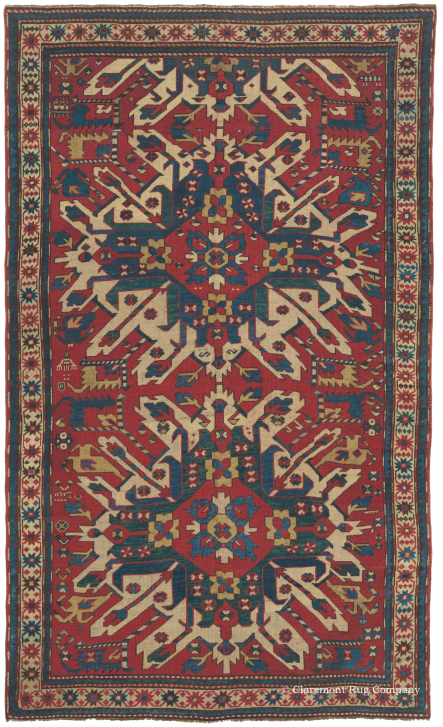 Due to the rugged simplicity and austerity of the tribal environment, rugs were a primary–and often only–mode of expression. The unity of the tribal bond is expressed in shared compositional formats, color palettes, and distinctive pattern language used by all tribal weavers of a certain region. This common vocabulary sometimes carried profound symbolic meaning, graphically representing cultural connotations that all members would understand. However, talented tribal weavers used these motifs and colors freely, a starting point from which creative individual interpretations were developed. With the advent of the commercial period in the early part of the 20th century, the pressures of market demand and political upheaval led to a dramatic decline in quality. Traditional forms and weaving practices were gradually abandoned in favor of methods more suited to mass production. Age-old motifs were reduced to regular, easily reproduced forms devoid of the spontaneity and individuality that gave tribal designs much of their artistic appeal. Harsh synthetic dyes often replaced more time-consuming natural dyes, removing the most nuanced and harmonious colors from the palette entirely. Wool quality suffered due to overproduction, while standards of craftsmanship declined, the ancient techniques lost forever. 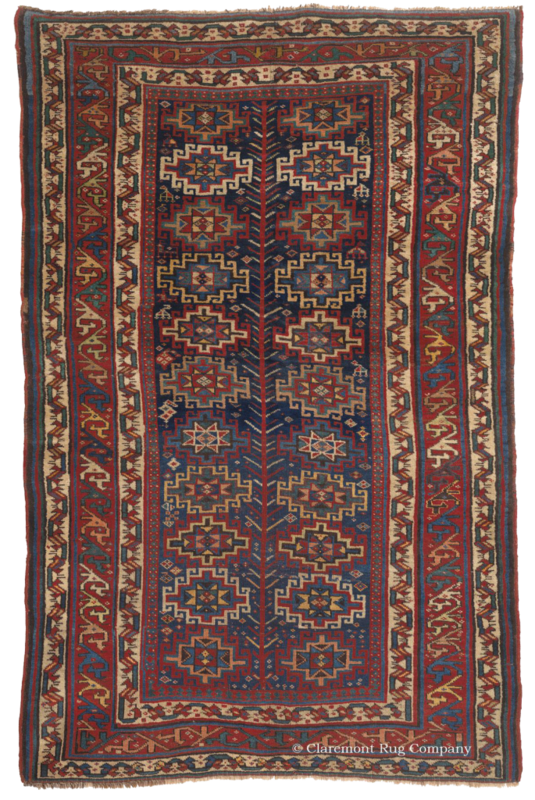 Qashqai rugs were woven by members of the Qashqai Confederacy, an ancient nomadic tribe living in the Zagros Mountains of the Fars region of Southern Persia. Divided into several nomadic clans, each of these tribal subgroups possessed its own variation on the tribe’s distinctive weaving style. 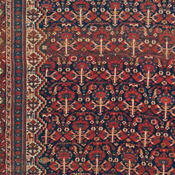 Weavers of this pastoral community produced rugs known for robust, saturated natural dyes, with deep indigo, ivory and characteristic “Qashqai” red frequently encountered, occasionally augmented by a broader range of complementary hues. The very fine knotting that many Qashqai weavers employed allowed them to use an intensity of ornamentation in their rugs with a great volume of intricately rendered plant, bird and animal forms filling each compositional zone. Small, randomly placed flourishes are often included in the design. 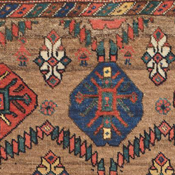 To view a selection of antique Qashqai rugs in the gallery, click here. Afshar is a rug style produced by the Persian Afshar tribe, a nomadic and village dwelling group principally located in the mountainous areas surrounding the modern city of Kirman in southeast Iran. The pattern language of antique Afshar rugs is very ranging, from graphic, elemental geometric designs to highly stylized adaptation of classical Persian floral motifs. Afshar tribespeople were traditionally highly skilled dyers using all natural dyestuffs. The traditional Afshar color palette employs saturated rust and brick reds, glistening royal to midnight indigo blue and highlights of gold, yellow and teal. Since the Safavid period, the Afshar tribal group has been among the most preeminent Persian tribal groups, migrating from their origins in Eastern Turkey and Azerbaijan to reside primarily in Southeast Persia. This background has led to the inclusion of numerous regional influences on Afshar weaving, resulting in a distinctive aesthetic that incorporates elements of several villages and nomadic Persian carpet styles, as well as Southern Persian design influences. Afshar carpets are virtually always found in the area size format. To see more of these extraordinary antique Afshar rugs in the gallery, click here. 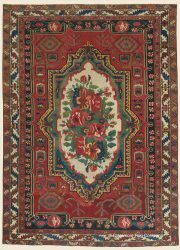 Khamseh refers to rugs from a 19th-century confederation of Arab tribes that are related in style and geographic origins to the Qashqai and Afshar traditions. Khamseh rugs are especially known for their idiosyncratic use of a diverse collection of tribal and zoomorphic devices, particularly the “murgi”, or chicken motif. 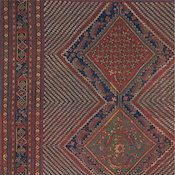 Like other nomadic weavings from the mountainous Fars region, the ornamentation is often continually varied, and augmented by naturally dyed hues of a saturated intensity. Many 19th century examples are noted for the use of unusually high-quality, lustrous wool in their construction. Arab Khamseh rugs employ the finest knotting, sharpness of design and greatest use of detail work of any rugs in this genre. To view a diverse gallery of beautiful Arab Khamseh antique rugs, click here. Shirvan rugs are associated with the Shirvan district, located in the eastern portion of the Caucasus Mountains, close to the western shore of the Caspian Sea. Shirvans are the most finely crafted of antique Caucasian rugs, using a wool warp and cotton weft. This allowed their weavers to create striking all-over patterns of intricately detailed, crisply drawn flowers, animals and polygonal motifs. Always retaining an overall aesthetic balance, the best Shirvans use some of the varied and creative of all oriental rug patterns. They employed both motifs traditional to their district and “borrowed” patterns from neighboring areas of the Caucasus, which they combined and reinterpreted in a refreshing, compelling manner, often with an unusually nuanced use of color. To browse a selection of exquisite antique Shirvan carpets in the gallery, click here. 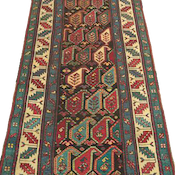 Karabagh carpets issue from a mountainous border region inhabited since the 17th century by people of varying religious and cultural backgrounds. Many Karabagh rugs were created by Armenian weavers who employed ancient Christian symbolic motifs into their patterns. For instance, the prized “Eagle Kazak” design, also known as Chelaberd Karabagh, whose sunburst medallions are often interpreted to symbolize Christ and his twelve apostles. Other design styles, such as the equally famed “Cloudband Kazak” (Chonzoresk Karabagh), bring Far Eastern dragon imageries into this cohesive blend of influences. Karabagh rugs often use saturated earthy colors, spontaneous drawing and deconstructed animal motifs. A specialized group incorporates lush florid designs influenced by the Russian Georgian style. To browse a selection of exquisite antique Karabagh carpets in the gallery, click here. 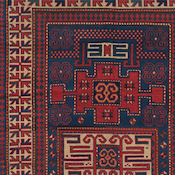 Gendje rugs are associated with the market town of the same name, through which Caucasian carpets from diverse neighboring areas of Kazak, Karabagh, Shirvan and Baku passed during the 19th century.The most recognizable Gendje design style consists of a field of broad diagonal stripes containing small abstracted flowers. 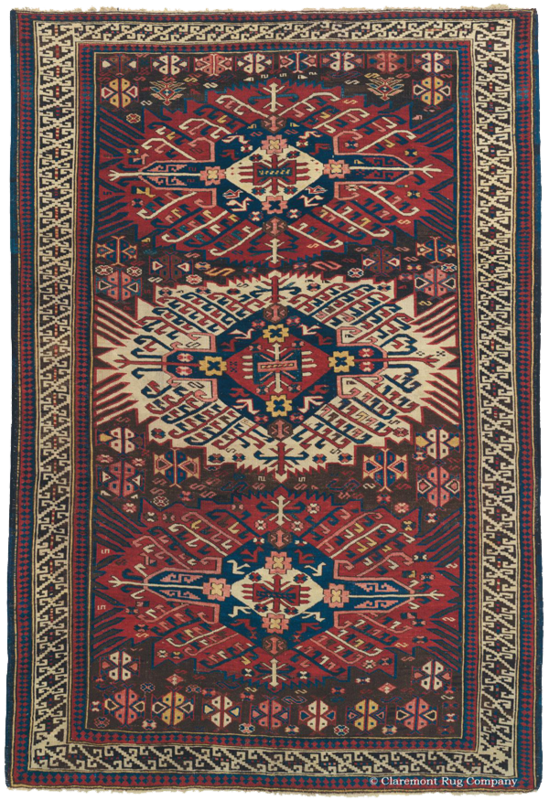 Gendje weavers were often inspired by patterns and motifs from each of these surrounding traditions, particularly Kazak, reproducing them in the finer weave that is synonymous with this region. Runner dimensions, rare in many other styles, were frequently produced and are strongly associated with this region. To view a selection of antique Gendje rugs in the gallery, click here. Daghestan rugs refer to tribal weavings associated with the northernmost rug producing regions of the Caucasus mountains. The district encompasses some of the most rugged and isolated portions of the Caucasus, as well as lowland plains near the town of Derbent and bordering the Caspian Sea. Carpets have been woven in this region from ancient times, with substantial production existing from the 17th century to the 19th century. The Daghestan region is known particularly for the production of finely-knotted prayer rugs of excellent construction. Beneath a prominent angular arch motif the finest Daghestan prayer rugs feature elaborate lattice works of intricately drawn, joyfully colored wildflowers. To see more of these extraordinary antique Daghestan rugs in the gallery, click here. Kuba is a tribal rug style produced in and around the town of Kuba, located in the eastern Caucasus Mountains. The region is bordered by major rug production centers of Daghestan to the north and Shirvan and Baku to the south. 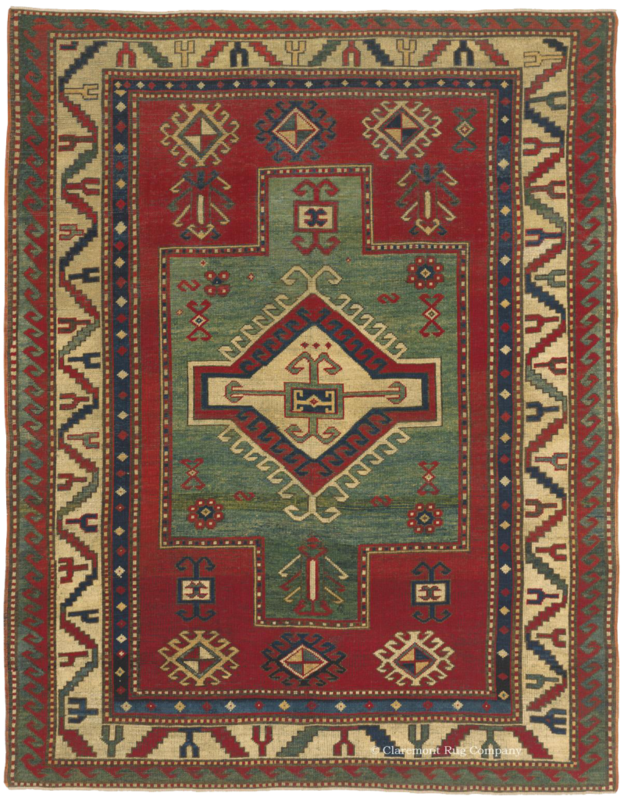 This proximity to a variety of significant Caucasian weaving centers permitted antique Kuba weavings to incorporate motifs and artistic influences from their neighbors, while retaining their own distinct style. 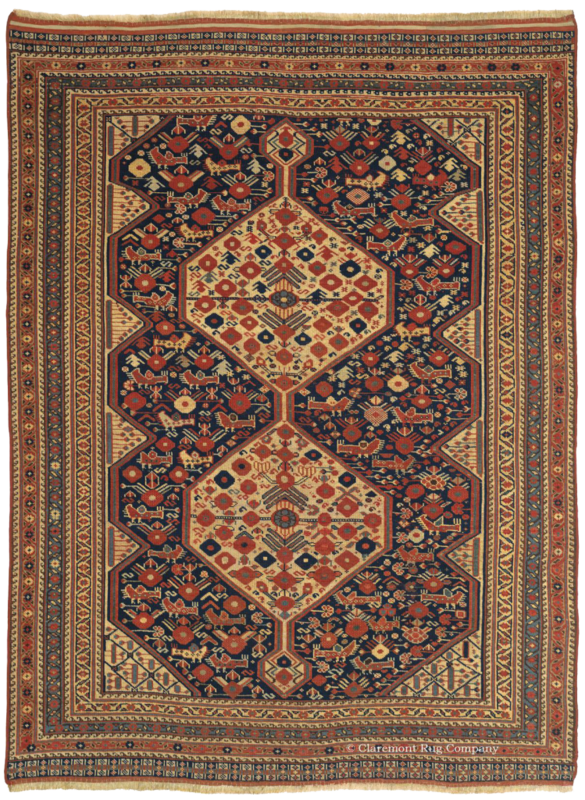 Antique Kuba carpets are frequently distinguished by their intricate designs, with a fine knotting and a closely clipped pile that adds clarity to the rugs’ often dense compositions. The best pieces before advent of the commercial period in the early 20th century reveal a mastery of natural dyes, with an extensive range of clear, sometimes exotic colors. To view a diverse gallery of beautiful antique rugs from the region of Kuba, click here. 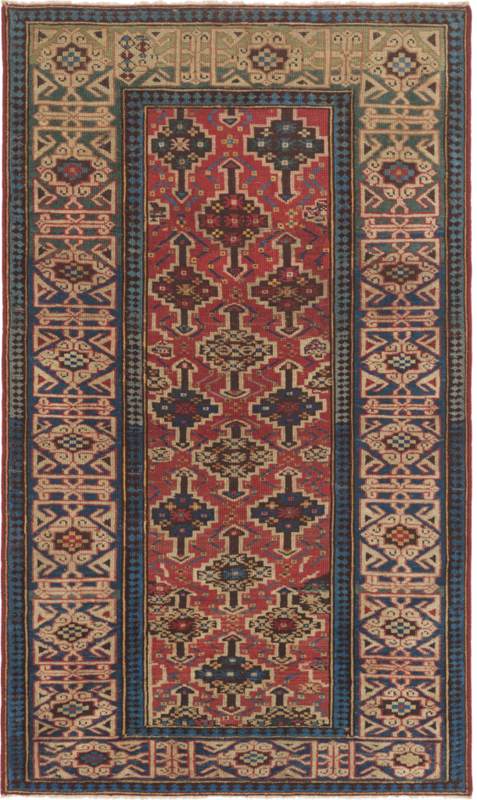 Bakhtiari rugs were woven by a nomadic tribespeople from the Zagros mountains, and prior to 1930 were created solely for use by the Bakhtiari people or for commissions within Persia. 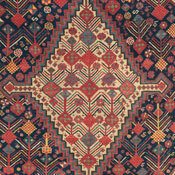 Traditionally, the Bakhtiari only produced geometric patterns, but influences from surrounding weaving centers with a tradition of floral patterns gave rise to a distinctive, stylized geometric floral that is unique to the Bakhtiari. Amongst these, the “Garden Compartment” rugs and “Guli Farang” patterned rugs from 19th century Bakhtiari weavers are some of the most sought after today.  Carpets produced by this group are well known for the extremely high quality of materials used, with rugs being woven of highly durable lanolin-rich wool, and the exuberant color palette favored by Bakhtiari weavers. The Bakhtiari were exceptionally adept with natural dyes, and high-end Bakhtiari rugs display an astonishing range of colors and color artistry, making virtuoso Bakhtiari rugs bold showpieces that are always in high demand. To browse a selection of exquisite antique Bakhtiari carpets in the gallery, click here. Northwest refers to a diverse grouping of antique rugs that share characteristics and patterns from Heriz, the Caucasus and the myriad tribal groups of Azerbaijan. Their patterns are difficult to isolate: Northwest carpets tend to be geometric, but are also often simplified, more elemental versions of Heriz carpets. Starkly geometric designs, highly reminiscent of Caucasian tribal rug styles, also appear. Runners and area sizes predominate in this style. Northwest carpets tend to be thicker in construction, with a cotton foundation. 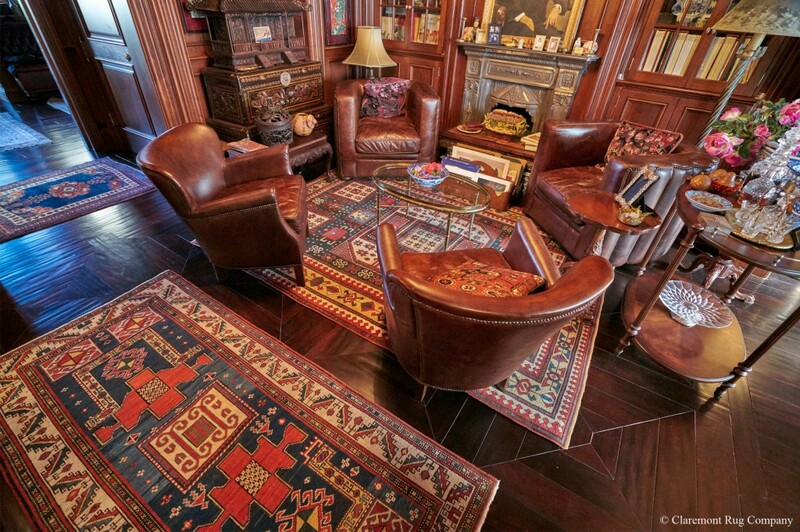 See which of these rare, enrapturing antique Northwest rugs are available here, in the gallery. As one of the nomadic tribes of Azerbaijan, the Shahsavan supplied wool to many of the weaving traditions in this mountainous Caucasian region. 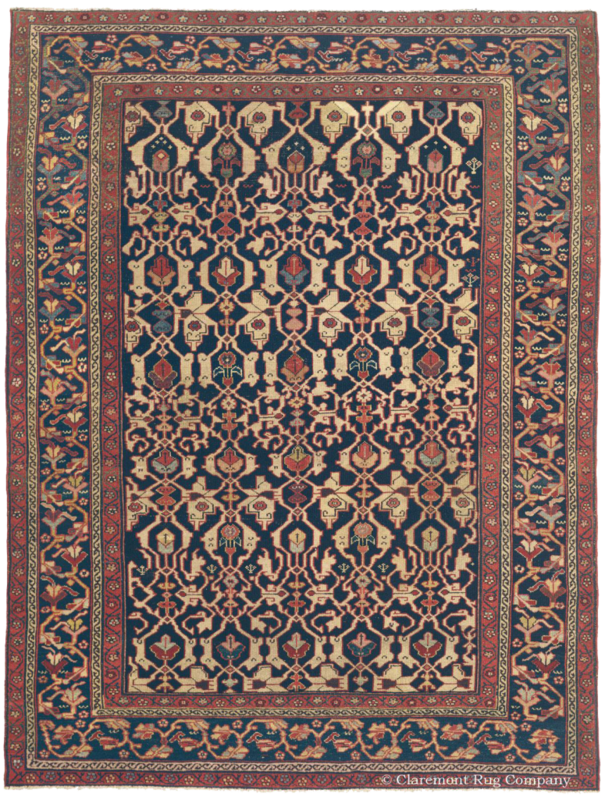 Shahsavan carpets share this close association with neighboring styles in their own weavings, which tend to incorporate influences of both Caucasian tribal and Persian village rugs in their design. Shahsavan rugs do not have a characteristic pattern, but are known for producing the full range of tribal trappings, including cradles, rifle bags and saddlebags. Designs are often strikingly abstracted, reduced to the most simplified geometric contours. 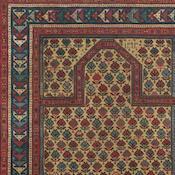 Most Shahsavans are flatweaves; pile carpets are extraordinarily rare. To browse a selection of exquisite antique Shahsavan carpets in the gallery, click here. Produced in very small numbers, Luri are among the scarcest of the antique South Persian tribal rugs. 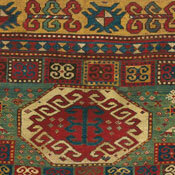 Rugs in this nomadic style were only woven in area size dimensions. As with other southwest tribal groups, the patterns are highly geometricized, but tend to be larger in scale than either Qashqai or Arab Khamseh carpets. Brilliant colors predominate, and while Luri rugs most often show a tendency toward dark blue backgrounds, this is by no means universal. Like many tribal rugs from the 19th century, Luri have a soft, floppy handle. To see more of these extraordinary antique Luri rugs in the gallery, click here.